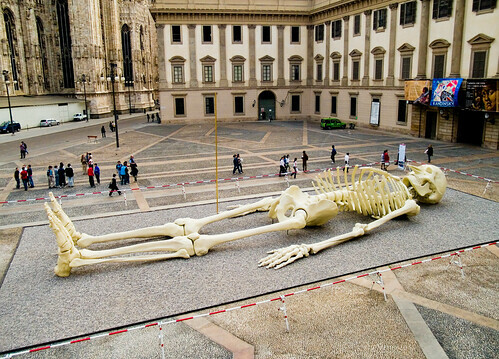 This giant, 24 metres long skeleton, is not any archeological discovery, rather it is a piece of art created by the Italian artist Gino De Dominicis. For some strange reason the late artist decided to name it "Calamita Cosmica" (meaning Cosmic Magnet - yes magnet and not calamity). 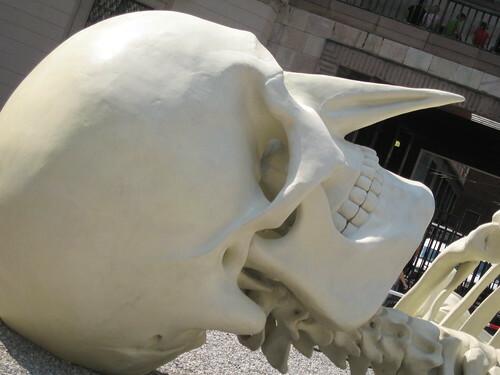 Except for its long nose the skeleton is a correctly scaled huge version of Homo Sapiens. 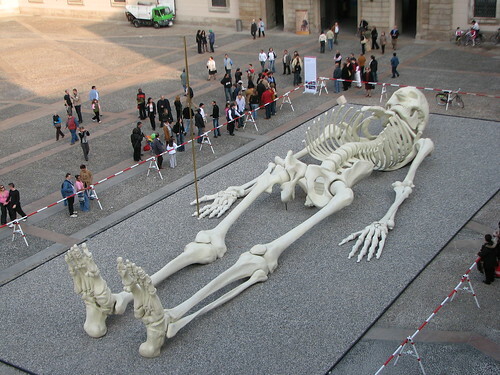 The Giant was first unveiled in 1990 at Centre National d’Art Contemporain in Grenoble, France. 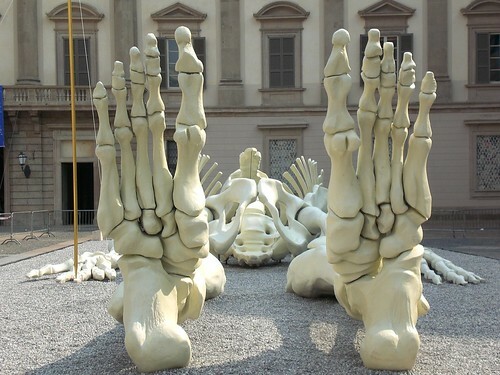 Thereafter in 1996 it moved to the courtyard of the Palace of Capodimonte, Naples. 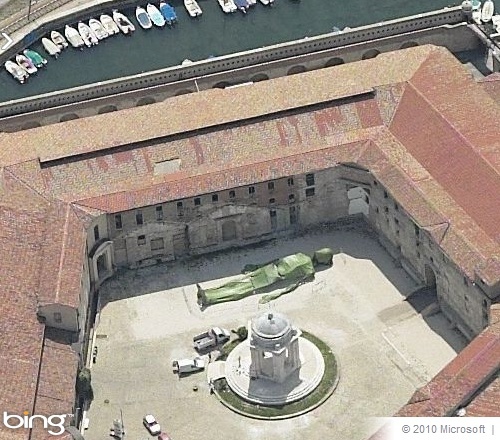 In 2005 it was at display at Mole Vanvitelliana, Ancona, Italy - the home town of the artist. 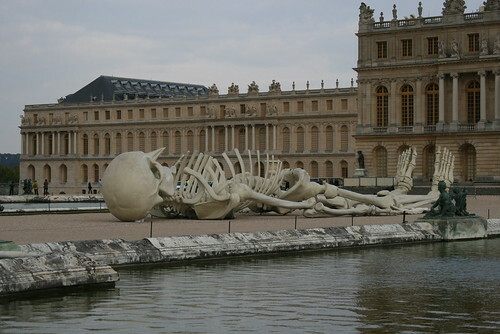 In early 2007 it moved to Palazzo Reale at Milan and after few months it landed in Versailles at 'Parterre d'Eau', in front of the facade of the Versailles Chateau. Thereafter in 2008 it was at display at Musée des Arts Contemporains, Hornu, Belgium. After the display in Belgium it has vanished or atleast I have not been able to trace it on the WWW. May be some of my readers will help me locate it. 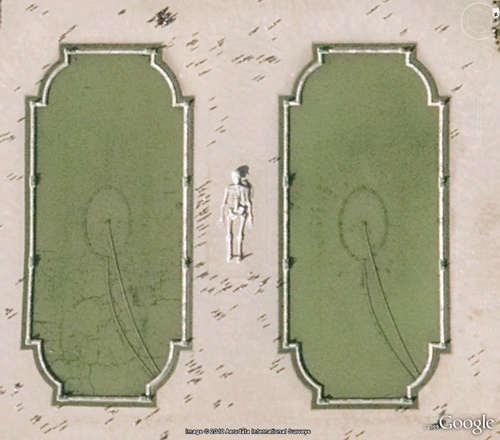 Thank you Felippo and Price Collins for making these great posts. I am also thankful to Scott, who vide his comments dated 4th June, 2010 informed me about the latest location (Rome)and sent the link to Flickr image (shown above) which was taken only yesterday. Thank you Scott. Thank you Scott for the info. I have included the Rome image also in the post.